We invite you to join us for the DISTRICT'S ANNUAL THANKSGIVING THROWDOWN celebrating diversity in sound. COME TOGETHER ON A DANCE FLOOR, TO MUSIC COVERING A WIDE RANGE OF ELECTRONIC MUSIC FROM SOME OF THE DISTRICT'S FINEST SELECTORS. 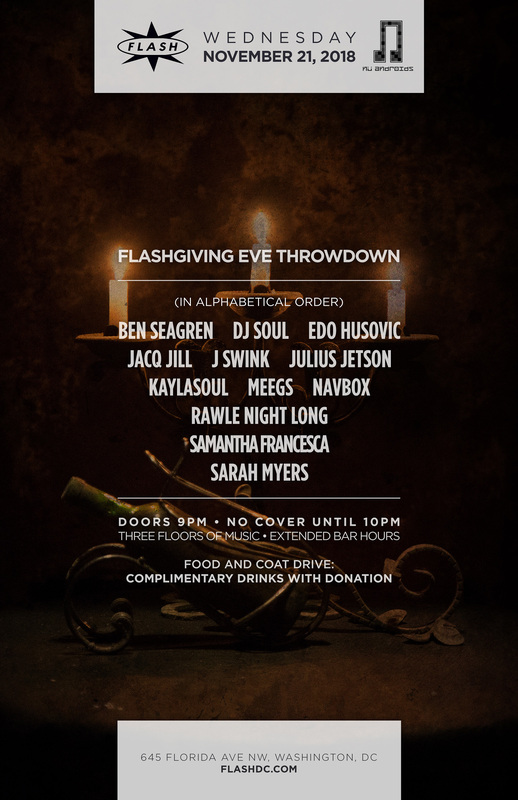 ALL THREE FLOORS AT FLASH WILL BE IN MOTION starting at 9pm, with no cover charge until 10pm. EXTENDED BAR HOURS UNTIL 4AM. We encourage all attendees to donate a cold-weather item such as a winter coat, or a non-perishable canned food item that will be donated to those in need in our community. Standing at the forefront of the ever-growing West-coast house & techno movement in the US is Ben Seagren – DJ, Producer, and visionary contributor within the Burning Man community. Ben is best known for his dual roles as co-founder and resident DJ of DISTRIKT recognized as the staple party experience of the Burn for its reputable artist roster, beautifully positive crowd experience and definitive, cutting edge sound. Playing host and DJ to well over 30,000 guests every year during one magical week in the desert, it comes as no surprise that Ben and his DISTRIKT moniker continue to entertain thousands of fans and followers with weekly podcasts on Soundcloud and Pod-o-Matic. Dominating San Francisco’s house & techno scene for over a decade with long-term residencies at both award-winning Ruby Skye (2003-2009) and legendary End-Up (2004-Present), Seagren’s impeccable taste and undeniable talent earned him the respect of even the most discriminating of techno aficionados- fans and peers alike. With a passion for connecting like minded souls on the dance floor and the continued support from a loyal fan base, Ben is propelling himself to new heights as one of the sonic architects behind tech-house’s most recent redesign. While traveling constantly between Los Angeles and San Francisco, Ben still leads the charge in SF with a residency at the End-Up, regular events at Public Works, Mighty and Audio. He is also constantly organizing DISTRIKT events and performing over 100 gigs per year in clubs and festivals across the US and Mexico. Ben has been a guest performer at the BPM festival in Playa del Carmen since 2012, headlined both LA and SF Decompression, and is a frequent guest at Frenzy After-hours at Bardot/Avalon Hollywood, and has held court at Ayslum After-hours in Honolulu, uHall in DC, Pacha NY and Nikki Beach Cabo San Lucas, to name a few. His most recent Beatport release, “Calling Me” on acclaimed Spanish label BeatFreak Recordings, (a massive big room techno banger) currently climbing the Beatport Top 100 techno chart, and is destroying dance floors internationally with support from contemporaries Victor Calderone, Carlo Lio, The Junkies, D-Formation, Peter Bailey and co-collaborator Richie Santana. Resident Dj Flash DC Minimal | House | Techno and everything in between! Techno, Minimal & Tech House Producer / DJ - J SWINK is a proven integral player in the Washington D.C. club scene. With over 15 consecutive years of performance under his belt he is known as a master of both reading & rocking the crowd. Meegs was first introduced to electronic music in the early 90’s when she attended her first “rave” at the Capital Ballroom in Washington DC. “Back then the staples were Scott Henry, Bad Boy Bill, Doc Martin, and Charles (gonna make you) Feelgood”, who came to be her “first” favorite dj. After moving to LA and meeting some local dj’s, she was invited to play percussion (congas, djembe) at various underground parties around Los Angeles. This spawned her career as a local promoter first, which led to dj’n and eventually hosting her own weekly parties ‘SPIN’, ‘XPRESSION’, ‘HAPPY HOUSE, HAPPY HOUR’ & ‘GET WELL SUNDAYS’ in LA. Keeping with her roots and traditional musicianship, Meegs is known for incorporating live music and dancing with her sets. Her organic, soulful sound invites live instrumentation where you can hear her preference for funk, latin, reggae & celtic beats fused with soul driven lyrics with emotional content. “My goal is to continue growing the HOUSE music community in DC & beyond, collaborate with other musicians, and attempt to make the Irish jig cool!” Meegs currently holds various residencies in DC, produces her own music & moving forward in the art of video-djing. Sarah Myers is widely recognized in the world of dance music as both a DJ and Event Promoter. As co-founder and resident DJ of “Life”, Sarah has helped to establish one of Washington D.C.’s most esteemed parties -- now into its fourth year. As a DJ, Sarah has played alongside some of the major players in today’s underground movement such as Matt Tolfrey, Jozif, Gavin Herlihy, Till von Sein, Clockwork, and Lee Foss. Sarah also hosts Hooked, a monthly podcast aired on DE Radio and TunnelFM where she holds residencies. It's featured past guests: Inxec, Bella Sarris, Ben Ashton, Randall M, and Chad Andrew.